Linlithgow Rose made it through to the last 16 of the Scottish Junior Cup with a convincing win over lower league Blackburn United. Five different players got on the scoresheet as Mark Bradley’s side made sure there would be no cup upset at the hands of the East Premier League outfit. Rose made the trip to New Murrayfield Park for the fourth round encounter boosted by the signing of Luke Whelan from Queen’s Park. 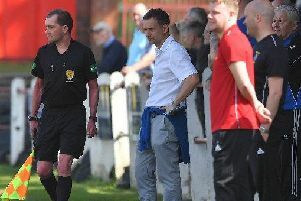 The former Kirkintilloch Rob Roy midfielder was handed a place in the starting line-up, while club captain Colin Leiper was on the bench and passed the captain’s armband to Ruari Maclennan. After just seven minutes, a chance arose for Tommy Coyne to put the visitors ahead but the Rose striker shot into the side netting from Iain Gray’s cross. A couple of minutes later, Coyne and Colin Strickland linked well and keeper Kyle Marley had to get down low to turn Strickland’s shot round the post. There were opportunities for both teams in the blustery conditions. Ruari Maclennan has a couple of shots saved by Marley, while at the other end Richie Hutton came close for the hosts with a shot just over the bar and Craig Chilton’s free-kick was held by Linlithgow keeper Darren Hill. In the 34th minute, there were shouts from the Rose camp for a penalty when Ruari Maclennan went down in the box after appearing to have his heels clipped, but referee Jordan Curran dismissed the claims. Just a minute later, however, the Rose took the lead . Gary Thom’s ball forward was headed on by Strickland to Coyne who controlled the ball well and shrugged off a Blackburn defender before firing past Marley into the corner of the net. Thom made it 2-0 four minutes before the interval, with a little help from Marley who fumbled his speculative shot from 30 yards out and the ball ended up in the back of the net. Early in the second half, Hutton forced a terrific save from Hill who fingertipped his shot round the post. But any ambitions Blackburn had of getting back into the game weren’t to last much longer. Just a couple of minutes later, Jamie Mackenzie headed home from a Martyn Shields corner from close range to put the visitors further ahead and end any hopes the home side might have had of a comeback. The first booking of the match went to Blackburn’s James Mildren in the 59th minute for a foul on Strickland. And a few minutes later, the Rose man’s free-kick from the edge of the box was deflected off the wall into the net past the helpless Marley to put Rose four up. Chilton and Hutton were then booked in quick succession for Blackburn, and then substituted along with Michael Gibson, to be replaced by Fraser Spence, Danny Campbell and Ross Williamson in a triple switch. But just seconds after the triple substitution the home side found themselves five down as a sweeping move ended with Strickland playing in Blair Batchelor who fired low past Marley. With just over 20 minutes remaining, Ruari Maclennan was replaced by Robert Sloan and then Roddy Maclennan replaced Batchelor. Rose might have added to their score. Coyne shot over the bar in the 80th minute, and in the 87th minute Sloan’s free-kick was not far away after he was fouled by Callum Rarity who was booked for his efforts. In the dying minutes of the match, Blackburn had a chance to grab a consolation goal when they were awarded a free-kick in a good position after a foul by Thom. But Brian Ross’s shot hit the underside of the bar and the danger was eventually cleared by the Linlithgow defence. In the end it was job done by Rose who made it through thanks to a solid performance from every area, including Whelan who was very impressive on his debut. Next up for Linlithgow on Saturday is another away cup tie against lower league opposition as they travel to face East Region South Division district league leaders Pumpherston Juniors in the second round of the Fife & Lothians Cup.